Former Army Specialist Tyler Roberts never gave up hope he’d one day see his partner again. And on Wednesday, August 19, that wish finally came true. 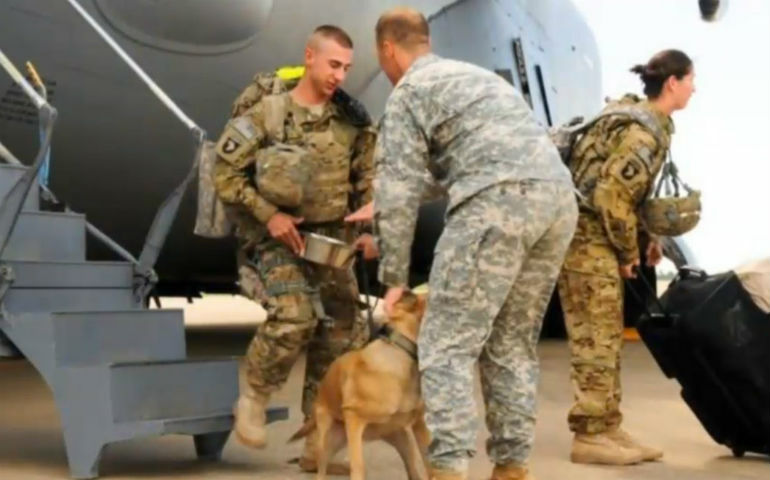 Roberts served in Afghanistan with Donna, a six-year-old Belgian Malinois in 2010. Donna is a tactical explosive detection dog, trained to sniff out explosive devices. According to KUSA, she found hundreds of pounds of ammonium nitrate during her time overseas. But when the deployment ended in 2011, Roberts lost touch with Donna. “I could never get a straight answer as to her whereabouts,” he said. Donna was one of the 12 former war dogs who were acquired by a private contractor and then abandoned at Mt. Hope Kennels in Chester, Virginia, for 17 months. The dogs, many of whom had PTSD as well as physical injuries, were cared for and rehabilitated by the kennel owner, Greg Meredith, who was told to wait for the contractor to find new jobs for the dogs. That never happened. As for Donna, her days of trekking through dangerous turf and of sitting in a kennel are all behind her. “I owe her my life and I intend to spoil her for the remainder of hers,” said Roberts. Meredith is still owed at least $150,000 for caring for the dogs during the time they stayed with him. Mission K9 Rescue set up a GoFundMe account on his behalf, and as of August 21, it has brought in over $30,000.